Few places in the world find nature so exuberant, or the tropical range of color and variety of plants and animals so extensive as in Costa Rica. With minimal advertising, this ecological haven has become extremely popular with over 1 million tourists each year, (2.9 million tourists visited in 2016) with diverse interests, from all over the globe. Costa Rica’s terrain ranges from pine covered mountains to lush rain forests; from drier low land areas to flowing rivers, lakes and waterfalls; from mountain ranges to vast expanses of jungle; from majestic active and inactive volcanoes to spectacular beaches - with ecologically diverse flora and fauna, making it one of the most beautiful places on earth. Some folks say the beauty of Hawaii without the cost. Slightly larger than the state of West Virginia, or a little smaller than the size of Switzerland, Costa Rica covers less than ½% of the earth’s surface, but it has about 6% of the planet’s bio-diversity, encompassed in 12 distinct ecological zones. Scientists throughout the world have even referred to this beautiful country as the living Garden of Eden. Costa Rica has made a huge commitment to environmental protection. More than 25% of the country’s land is protected by one of the best developed conservation systems in all of Latin American, including national parks, private reserves and refuges. This was accomplished from the efforts of a number of successive government administrations. Many of these species are protected by law. A country in harmony with nature, ideally situated between the Pacific Ocean and the Caribbean, this tropical paradise is a natural wonder. 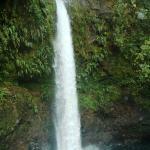 It's easy to understand why Costa Rica is constantly ranked amongst the most beautiful countries in the world. With its delightful vegetation, exquisite terrain and its waves lining golden beaches, one can also find flowing rivers, lakes and beautiful waterfalls and majestic active and inactive volcanoes. Costa Rica is every visitor's paradise. Not many people leave the country with anything less than happy memories. Every year, millions of people visit the country. As noted above, in 2010, over 2 million tourists visited the country. With coastlines on two different oceans, it's not surprising that Costa Rica's beaches are some of the most beautiful in the world. Up and down both the Pacific and Caribbean you can find awesome looking beaches. Santa Rosa National Park - This was the first national park in Costa Rica and is the largest Dry Forest Protected Area in the country. Featured here are some gorgeous, unpopulated beaches. An 8 mile (13 km) drive from the main Park Ranger station that requires four-wheel-drive will lead to untouched wilderness, abundant wildlife, and spectacular wave action at Playa Naranjo. This is the place where you will see the famed "Roca Bruja" (Witch's Rock) that reaches out of the sea and has made this area famous for its first class surfing . Playa Flamingo - Just south of Portrero, this magnificent beach has pristine white sand while the calm waters are crystal clear, perfect for sunbathing and swimming. A mile-long, crescent shaped beach, also known as Playa Blanca (White Beach), is as beautiful as any of the famed beaches in Costa Rica, and is among the first of Costa Rica's beaches to receive international attention. Scuba diving, golf, and deep sea fishing are all popular things to do in this area besides lounging the day away at the beach . Playa Conchal - Named for the many conchas (shells) that are found here, Playa Conchal is a pristine beach located about 2km south of Brasilito. This exquisite beach offers incredible stretches of sand overlooking the Catalina Islands. . With turquoise waters, somewhat rare for Costa Rica beaches on the Pacific side, Playa Conchal offers clear water for snorkeling and fantastic white sand. Playa Grande - Just to the north of Tamarindo, Playa Grande is a long, beautiful stretch of sand located within the Parque Nacional Marino Las Baulas. Not just nice beach to look at, the park is a nesting site for the massive, magnificent, and endangered leatherback turtles. Aside from its breathtaking beauty Playa Grande offers a bohemian lifestyle while surrounded by largely developed neighboring beaches. 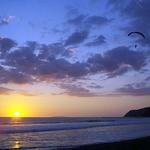 Playa Gande is also known as one of the best Costa Rica beaches for surfing. Playa Guiones - Near Playa Nosara, this pretty beach is near quite a few other nice beaches along the Nicoya Peninsula including Playa Pelada. From December to April, Guiones is a very popular surfing beach, and when there aren't many waves the beach offers some great snorkeling. Playa Nosara, Garza, and Guiones are all secluded nature beaches and are perfect for relaxation, surfing and exploring. Playa Sá mara and surrounding beaches - A pretty, white to light-gray sand beach that is perfect for swimming, Playa Sá mara is a great destination that is just recently being discovered. The crescent-shaped strip of pale-grey sand at Sámara is one of the most beloved beaches in Costa Rica – it’s safe, tranquil, reasonably developed and easily accessible. There is also a large coral reef to explore and many boutique hotels, vacation rentals, and restaurants to choose from. Several boat tours are available allowing you to discover everything from dolphins and huge manta rays to slow moving giant turtles . Popular with the locals, Playa Sá mara and surrounding areas are still just gaining popularity with travelers. 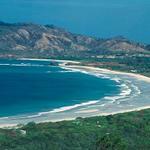 The town of Sá mara is quieter than some other places like Tamarindo to the north.
. Even nicer though are the beaches nearby including Playa Carrillo, Playa Barrigona, and Playa Buena Vista, which are all relatively deserted. With its long, reef-protected beach backed by an elegant line of swaying palms and sheltering cliffs, Playa Carrillo is a postcard-perfect beach located next to the small fishing village of Puerto Carrillo and is a candidate for the most picturesque beach in Costa Rica. An offshore reef protects the bay. Santa Teresa & Malpais - Welcome to some of the most beautiful beaches in the world: Malpais and Santa Teresa, known for their rugged jungle beauty, unforgettable sunsets, and especially for the epic surfing in Santa Teresa. With Malpais just to the north and Santa Teresa to the south, these two beach villages constitute some up and comers among the many beautiful Costa Rica beaches along the Nicoya peninsula. Malpais is a rockier beach, with lots of tide pools and rock formations to explore, while Santa Teresa features white sands and relative privacy. Montezuma - Here at the southern end of the Nicoya peninsula is a fantastic beach, and nearby waterfalls to set it apart from other Costa Rica beaches. Pleanty of good surfing here. Long known as the beach to go to if you just want to get away from everything, Playa Montezuma is the gathering place for Costa Rica’s most individual and eccentric visitors. For years this has been the beach for celebrities and famous musicians to visit out of the glare of the spot-light and has become a haven for the bohemian traveler. Manuel Antonio - This relatively small national park is also one of the country's most popular, and contains a charming combination of rainforest, beaches and coral reefs. With it comes some of Costa Rica's most beautiful beaches that you can discover in Manuel Antonio National Park, lined with lush forest, and they are particularly good for swimming and snorkeling.ed with lush forest, and the snorkeling is excellent too. Parque Nacional Marino Ballena - Whale Marine National Park features beautiful light brown beaches lined with palm and almond trees. But as the name implies, the park offers something else that sets it apart from other Costa Rica beaches; from December to March you might be able to see humpback whales migrating down from the waters of Southern California with their newborn babies. Ballena Bay Beach and Piñuela Beach are both nesting grounds for the olive ridley and hawskbill sea turtles. Dolphins are sighted in the area year round. Coral reefs protected by the park make for good snorkeling, particularly at Uvita Point. Zancudo - With close to 6km of dark-sand beach here, world-class fishing, and fantastic swimming in tranquil waters, Zancudo is a relatively undiscovered gem compared to some other Costa Rica beaches. This remote and un-touristy region is one of the last areas of Costa Rica to be discovered by foreign travelers -- it features some of the most beautiful and untouched areas of the country . Located a long the southern Pacific coast, near Golfito, lies this long sandy beach that stretches along the warm blue waters of the Golfo Dulce. As far as the eye can see, the sparkling waters are fringed by coconut palms and almond trees. nd un-touristy region is one of the last areas of Costa Rica to be discovered by foreign travelers -- it features some of the most beautiful and untouched areas of the country. Dominical - A beautiful beach with amazing surf, Dominical is popular with surfers and backpackers, and remains a small town, in an under-developed area. "With a stunning setting, and miles of nearly deserted beaches backed by rainforest covered mountains, Dominical and the coastline south of it are excellent places to find un-crowded stretches of sand, spectacular views, [and] remote jungle waterfalls..."
Cahuita - This Caribbean town lies north of Puerto Viejo and offers a beautiful black sand beach several miles long aptly named Playa Negra (a favorite turtle nesting site) and a 2km long crescent shaped golden-white sand beach to the south called Playa Blanca. Located just north of downtown Cahuita, Playa Negra (Black Beach) stretches for several miles along quiet, almost deserted coastline. In addition to its striking beauty, Black Beach promises both big waves for surfers and quiet waters for swimmers . Playa Blanca, Cahuita’s famous White Beach offers fine, white sand flanked by towering coconut palms and sea almond trees. The fact that the town is right next to beautiful coral reefs for snorkeling and Cahuita National Park provides for some excellent wildlife viewing opportunities, both above and below the water. Manzanillo & the Gandoca-Manzanillo National Wildlife Refuge - This site just south of Puerto Viejo is reachable by car or bike. Here you will bind stunning, picturesque beaches with beautiful rock formations and lovely warm water. Some snorkeling can be enjoyed around Manzanillo (though be careful of riptides). This place definitely features some of the most dramatic Costa Rica beaches. Playa Manzanillo - this town’s beautiful beaches have remained pristine, tranquil and untouched by tourism in comparison to other areas. Seaside almond trees bow over the sand, providing shade for reading or relaxing. The beach’s fine sand is perfect for building sandcastles and sunbathing. Snorkelers and divers can swim to coral reefs close to the shore. 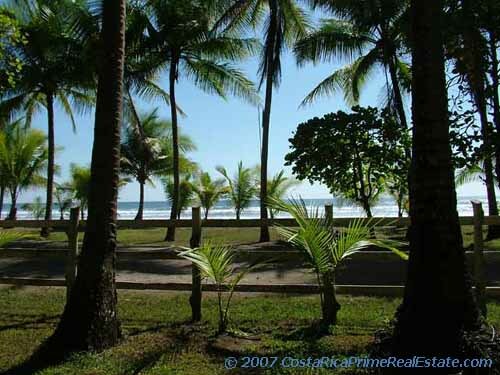 Gandoca - Playa Gandoca is a pristine, dark sand beach on Costa Rica’s southern Caribbean Coast. The shore is a stone’s throw from the Panamanian border. Drake Bay, Costa Rica Drake Bay is one of the most remote and natural settings in Costa Rica that tourists will encounter anywhere in Costa Rica. The Drake Bay area has an abundance of wildlife, (particularly birds), combined with great accomodations and friendly people make this one of the most spectacular and memorable places to visit.